I’ve been baking up a semi-storm this week! Only 5 days until the big day! Whoa. I’m ready now. I mean there’s only so much one can do right? As long as we are all together, surrounded by family, life is good. Oh, and a table full of treats helps too! 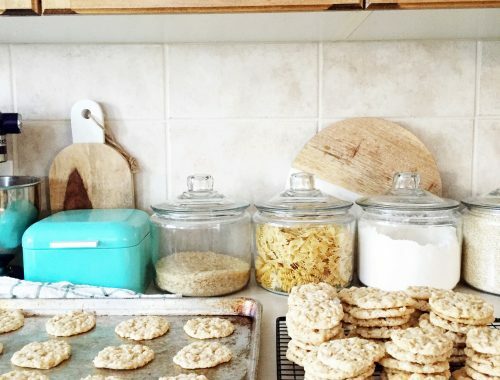 I will be adding these cookies to our treat table this year! 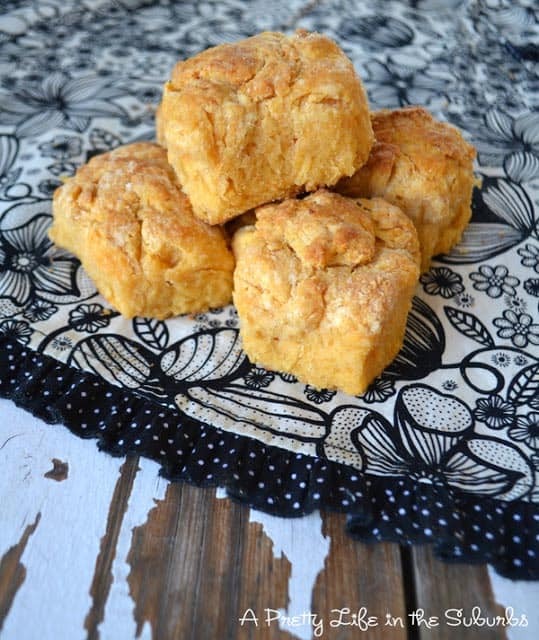 They are kind of a nice change from the cookies you find this time of year…and for some reason I don’t make them often enough. But when I do make them, I am reminded of how much I like them, and how they aren’t really that hard to make. A little more tedious than some recipes, but sometimes I like the extra little challenge! Especially when that challenge is good for my taste buds! So on to my recipe! Give them a try! If you love nuts and jams, these are for you! In a bowl sift together flour and salt. Set aside. 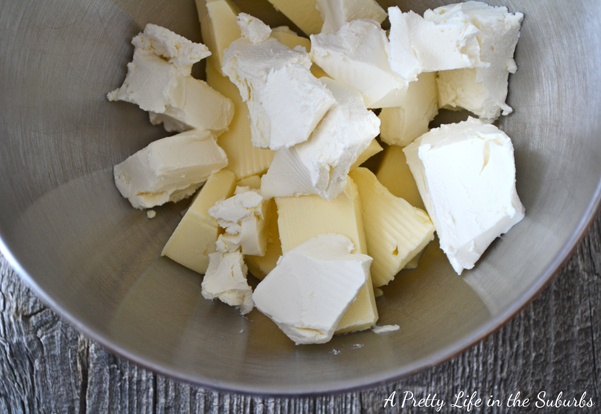 Cut up the butter and cream cheese into chunks, into a bowl to be creamed. Add the lemon zest, vanilla extract and vanilla bean seeds to the butter mixture. Combine well. Beat in the flour mix. Mix well. Work the dough into a ball, then split the dough into 2 balls. Flatten each ball into a 6 inch disk, and wrap in plastic wrap. Refrigerate for at least 1 1/2 hours. Preheat your oven to 350 degrees. Then spread the nuts evenly out onto a cookie sheet. Toast the nuts in the oven for 6 to 9 minutes, or until lightly browned. Watch carefully, and don’t burn them! When the nuts are toasted, set them aside to cool. When they are cooled, using a knife chop them up. Then get out your food processor!! Use it to combine the chopped nuts, jam, honey and cinnamon. Combine until the pecans are coarsely ground. 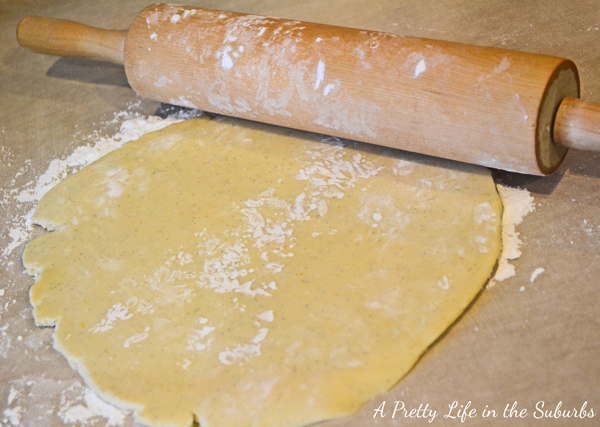 With a rolling pin roll the dough out into a 16 inch circle of even thickness. If the dough is too stiff, just knead it in your hands for a bit. 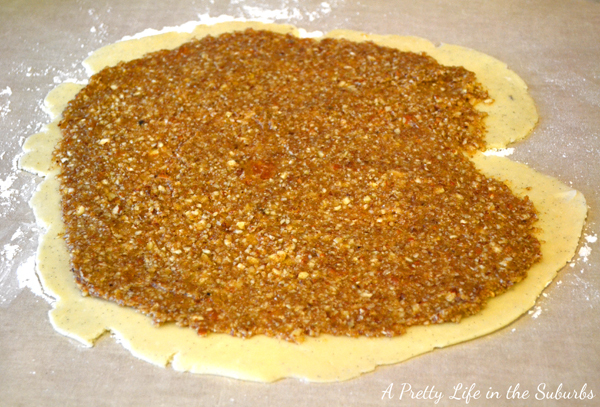 Using half of the jam filling, spread it out evenly onto the dough, leaving about a 1cm space from the edge. Using a knife slice the dough first into 4 equal quarters. Then slice each quarter into 6 equal pieces. 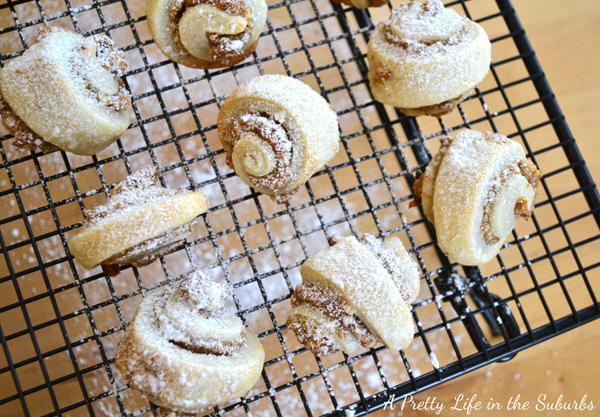 It’s time to roll the rugelach! 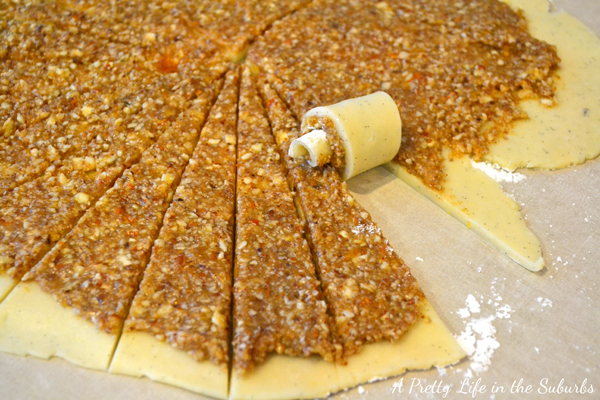 For each wedge, start from the edge of the dough and roll to the centre. Roll, roll, roll until you have a cute little crescent! Then take each dough crescent, generously dust it with powdered sugar, and place on a cookie sheet. Space them about 1 1/2 inches apart. Bake in a preheated 350 degree oven for 14-18 minutes, until the tops start turning golden brown. Immediately remove them from the pan, and place them on a cooling rack. Generously dust them with powdered sugar again. Repeat all the above steps for the second disc of dough and the remaining filling. Cut the butter and cream cheese into chunks, and put into a bowl to be creamed. Using half of the jam filling, spread it out evenly onto the dough, leaving about a 1cm space from the edge, as shown above. Using a knife slice the dough first into 4 equal quarters. Then slice each quarter into 6 equal pieces. 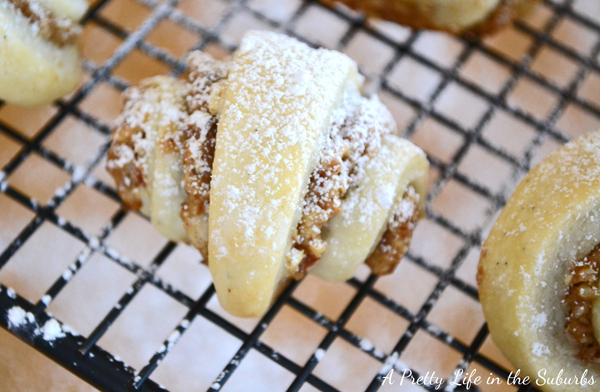 It’s time to roll the rugelach! 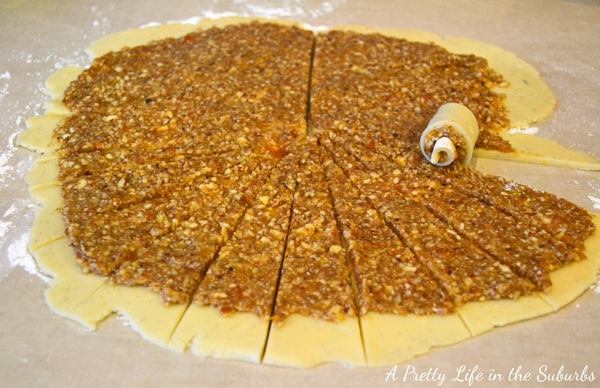 For each wedge, start from the edge of the dough and roll to the centre. 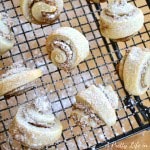 Then take each dough crescent, generously dust it with powdered sugar, and place on a cookie sheet. Space them about 1 1/2 inches apart. Bake in a preheated 350 degree oven for 14-18 minutes, until the tops start turning golden brown. Immediately remove them from the pan, and place them on a cooling rack. Generously dust them with powdered sugar again. Repeat all the above steps for the second disc of dough and the remaining filling. I used a mixture of half pecans and half almonds, but you could use any nut combination that you like. 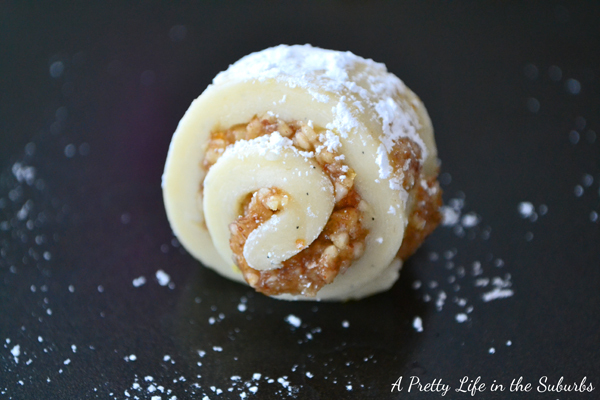 Walnuts, pecans or almonds are delish! And I bet you could use what ever jam flavour you like too! Marmalade, raspberry, strawberry! 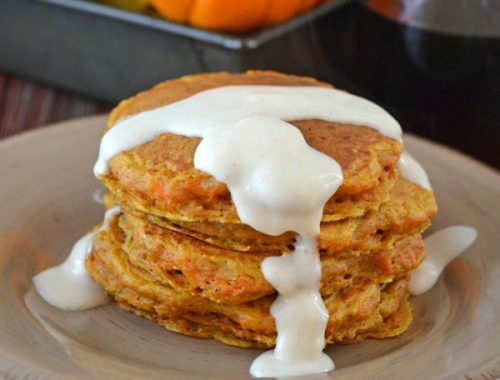 And trust me, these are not as hard to make as they may seem! Oh WOW! are you bringing some of these?? please please . . .
Mmmmm! My grandma made something similar to this when she was alive and they were SO yummy!! !